Slinger Francisco, the Mighty Sparrow, has been performing on stage at the Kaiso House Calypso Tent for the 2014 carnival season. 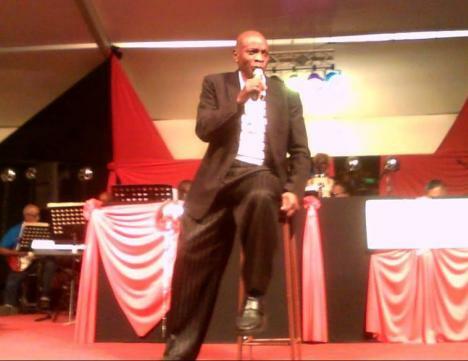 His debut appearance on Thursday, February 13, 2014, moved the audience at the Queens Park Savannah venue to tears. Accompanied by his wife Margaret, Sparrow was first warmly greeted by executive members of the Trinbago Unified Calypsonians Organisation (TUCO), including calypsonian Twiggy, Marvelous Marva and Duane O’Connor. O’Connor had the honour of assisting Sparrow into his jacket moments before his performance. When the Mighty Sparrow was announced on stage at the start of the second half around 10:30 pm, the audience stood and gave the ‘Calypso King of the World’ a near three-minute ovation. The “Birdie”, as he is affectionately known, delivered a repertoire that included “Saltfish”, “Congo Man” and “Man in de Bedroom”. Sparrow engaged his audience throughout and even stunned the backup vocalists when he crooned some high notes. The ladies stopped in mid performance and gave him a spontaneous ovation. In fact, Sparrow’s performance was punctuated with three standing ovations. But as he sang Frank Sinatra’s “My Way”, audience members became visibly moved – some openly wept – including calypsonian Singing Sandra, who sat with some members of the Kaiso House cast to witness his performance. President of TUCO Lutalo Masimba said welcoming home the Mighty Sparrow is a real nice moment… a beautiful moment in life — not just in the musical life — but in life. Masimba, a veteran culture man himself, noted that the Mighty Sparrow changed the landscape in the musical genre that is calypso throughout the Caribbean. “The Mighty Sparrow represents not just a big artiste, you know, but he has helped to carve out the landscape in which we dwell, not only in Trinidad and Tobago but in the region. And so many people do not see that. Maybe some people don’t like calypso or they don’t understand the significance of calypso but it goes beyond that,” he said. The TUCO president further spoke of the mettle of the man Sparrow and his dedication to the art form. “For the Mighty Sparrow is a major artiste in the world and so when you look at the experience that he has been through health wise and so on and to know that he walks again and comes home and he is ready to sing. And so we look forward to welcoming Sparrow to Kaiso House. Last year we had a beautiful year with Sparrow because he sang with us throughout the season. And I hear so many stories about Sparrow. Working with him is a beautiful experience. He comes to work and all he wants to know is when am I singing. He waits and asks what you want me to sing and he sings that. He acknowledges the audience,” Masimba added. Slinger “the Mighty Sparrow” Francisco is a Trinidad and Tobago citizen but he was born in the rural community of Grand Roy on the Spice Island of Grenada. Now 78 years of age, at the age of one the Mighty Sparrow moved to Trinidad and Tobago with his mother where his father had already been residing. Sparrow has won the Trinidad and Tobago Road March competition eight times and the Calypso King Monarch also eight times.